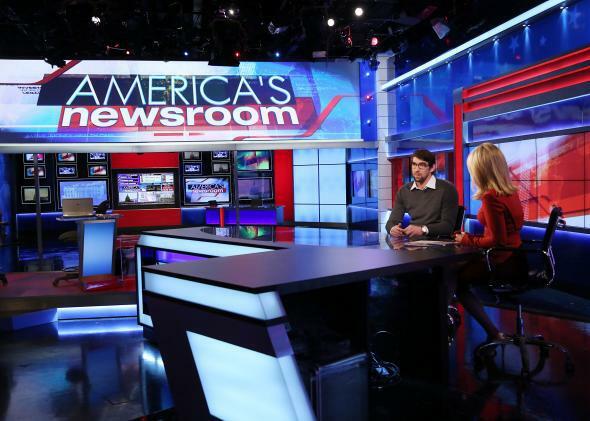 Does watching Fox News make you less informed? This post originally appeared in Business Insider on May 22, 2012. Media outlets such as Fox News and MSNBC have a negative impact on people’s current events knowledge, while NPR and Sunday morning political talk shows are the most informative sources of news, according to Fairleigh Dickinson University’s newest PublicMind survey. Researchers asked 1,185 random nationwide respondents what news sources they had consumed in the past week and then asked them questions about events in the U.S. and abroad. On average, people correctly answered 1.6 of five questions about domestic affairs. Because the aim of the study was to isolate the effects of each type of news source, they then controlled for variables such as other news sources, partisanship, education, and other demographic factors. 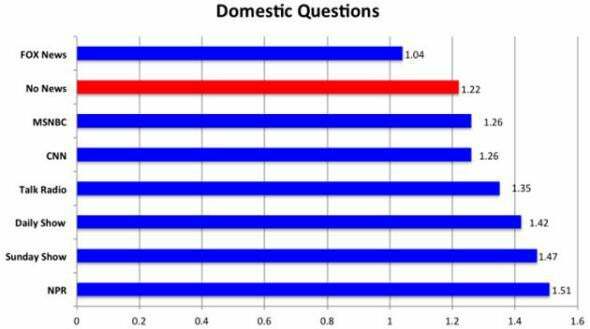 They found that someone who watched only Fox News would be expected to answer 1.04 domestic questions correctly compared to 1.22 for those who watched no news at all. Those watching only The Daily Show with Jon Stewart answered 1.42 questions correctly, and people who only listened to NPR or only watched Sunday morning political talk shows answered 1.51 questions correctly. In terms of international news, people correctly answered an average of 1.8 of four questions. 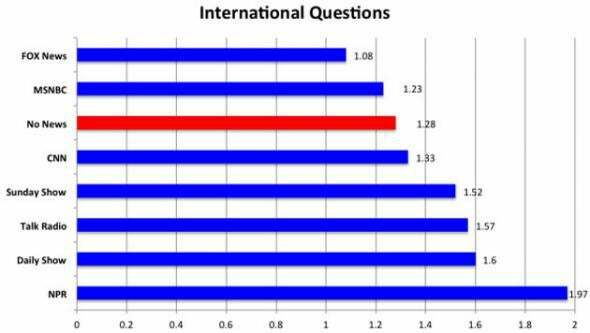 With all else being equal, people who watched no news were expected to answer 1.28 correctly, those watching only Sunday morning shows figured at 1.52, those watching only The Daily Show figured at 1.60, and those just listening to NPR were expected to correctly answer 1.97 international questions. Those watching only MSNBC were expected to correctly answer only 1.23 out of four, while viewers of only Fox News figured at 1.08. The study noted that the effects of Fox News, MSNBC, and talk radio depended on the ideology of the consumer. Thus, those who watched no news—answering questions by guessing or relying on existing knowledge—fared much better than those who watched the most popular 24-hour cable news network (i.e., Fox News). It is a follow-up to a 2011 survey of 612 New Jerseyans that found, among other things, that those who watched Fox News were 18 points less likely to know that Egyptians overthrew their government than those who watch no news at all.